The Federal Election Commission said Thursday that comedian Stephen Colbert can use his TV show's resources to boost his political action committee, but he must disclose some major expenses as in-kind contributions from the show's corporate owners. After meeting with the commission Thursday morning, Colbert emerged and gave a speech to a crowd outside -- those he called friends, Americans and government employees who have a very liberal lunch hour. "Moments ago the Federal Election Commission made their ruling, and I'm sorry to say ... we won!" Colbert said to cheers. "I am a Super PAC, and so can you!" Colbert played it straight during his appearance before the commission, letting his attorney do most of the talking while saving his trademark quips for a crowd that gathered outside the commission building after the meeting. "I don't accept the status quo," he told the crowd, brandishing a portable credit card processing machine. "I do accept Visa, Mastercard or American Express." Many in the crowd handed Colbert their credit cards or dollar bills as contributions. Asked what point he was trying to make about corporate America, Colbert did not miss a beat. "None," he quipped. "I want their money." Colbert, who plays a conservative TV pundit on "The Colbert Report," is forming Colbert Super PAC, a type of political action committee which will allow him to raise unlimited amounts of money from corporations, unions and individuals. The money will be used to support or oppose candidates in the 2012 elections through independent expenditures such as TV ads. pushing for a rollback to give corporations and other wealthy donors stronger sway in financing campaigns. publicly disclose them as in-kind contributions from Comedy Central's parent company, Viacom Inc.
Colbert has said those undisclosed contributions could include the use of his show's staff to create TV advertisements about candidates that would air as paid commercials on other shows and networks. The commission ruled 5-1 that he would have to publicly disclose as in-kind contributions from Viacom any ads produced by the show for Colbert Super PAC that air on other shows or networks. He would also have to disclose administrative costs that his show covers for Colbert Super PAC. 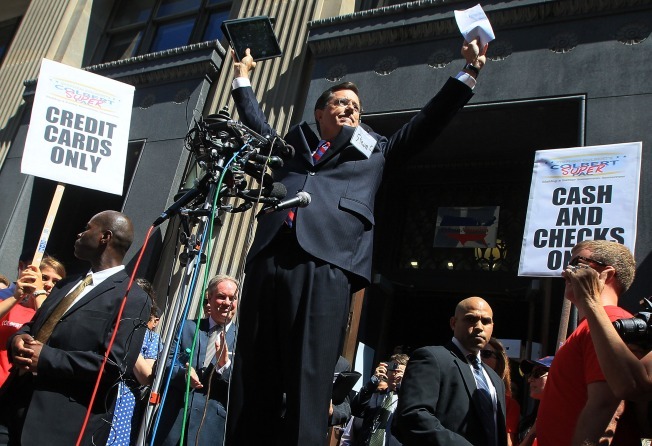 "It has been said that freedom isn't free," Colbert told a crowd outside of the FEC. "Today we have placed a sizable down payment. Today, we put liberty on layaway." The Colbert ruling eclipsed a lesser-noticed decision by the Federal Election Commission Thursday that could also have a significant impact on the 2012 elections. The commission said that candidates and party officials may solicit contributions for super PACs, but those contributions could not exceed the $5,000 limit for donations that applies to traditional political action committees. Some campaign watchdog groups had feared that the commission might permit candidates and party officials to solicit unlimited contributions, opening yet another door to big-ticket donations. While Colbert delights in lampooning politicians on his Comedy Central show, he raised some serious issues about public disclosure of corporate campaign contributions before the Federal Election Commission. "Stephen Colbert is a funny man, but he asked a legitimate question and received a serious answer," said Federal Election Commission chair Cynthia Bauerly. "The opinion adopted today does not give him everything he asked for, but it appropriately applies the press exemption consistent with past Commission and court precedent. " and who could opt to create their own super PACs to take advantage of any new loopholes. worked, as TV hosts or commentators. finance reform advocates complained the ruling gave wealthy donors, particularly companies and unions, considerably more sway in politics. Colbert has said any ads for Colbert Super PAC would not be coordinated with any candidate or party.